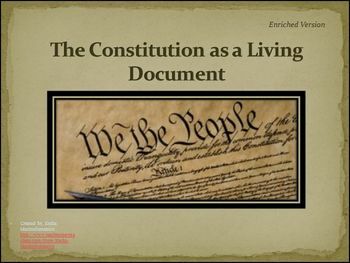 What are the four ways to change the Constitution which make it a “living document”? You SAVE $1.00 by purchasing this bundle instead of each item individually. Below are the links to the PowerPoint and the lesson plan so that you can see the ratings and the comments of them or purchase one and not the other. Please download the preview file so that you have a better understanding of what you are purchasing. The lesson plan and PowerPoint were last revised on 10/21-22/2013. All links worked on those days but I cannot guarantee any links because I do not control the internet. 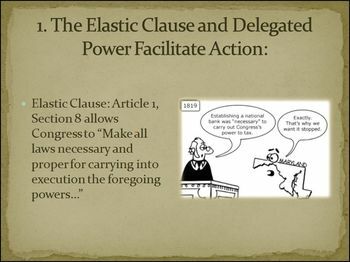 Thank you in advance for rating and commenting on this lesson plan. Please be as specific as possible when you comment so that other teachers know why you rated as you did. It also helps me become a better teacher and writer. 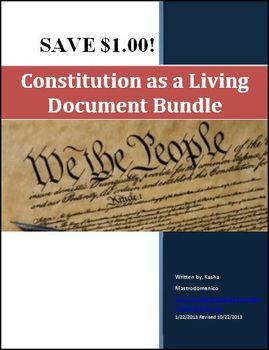 Constitution as a Living Document Bundle by Kasha Mastrodomenico is licensed under a Creative Commons Attribution-NonCommercial-NoDerivs 3.0 Unported License. Based on a work at http://www.socialstudiesdifferentiatedinstruction.com. Permissions beyond the scope of this license may be available at http://www.socialstudiesdifferentiatedinstruction.com.